The fall grape harvest in Tuscany is a lovely time of year, but never mind that the hillsides are beautiful, cloaked in vines laden with bunches of dark grapes, and the fragrance of fermenting wine permeates the villages. Just watch where you step. When I lived on a hilltop near Radda in Chianti, there were grapevines covering the slopes below my house, and every year when the grape harvest would begin, the grape pickers would arrive early in the morning and I would awake to the rustling of grape leaves, and rhythmic snipping sounds as bunches of grapes were cut and dropped into a crate. Every so often the rhythm would be broken by a screech – “Vipera!” Everyone would drop what they were doing and rush to see the viper, which would have already slipped out of sight. This would happen periodically through the course of the day, until the cry of “vipera!” echoing across the valley became as common as birdsong. I began to see that Tuscans were obsessed by vipers. 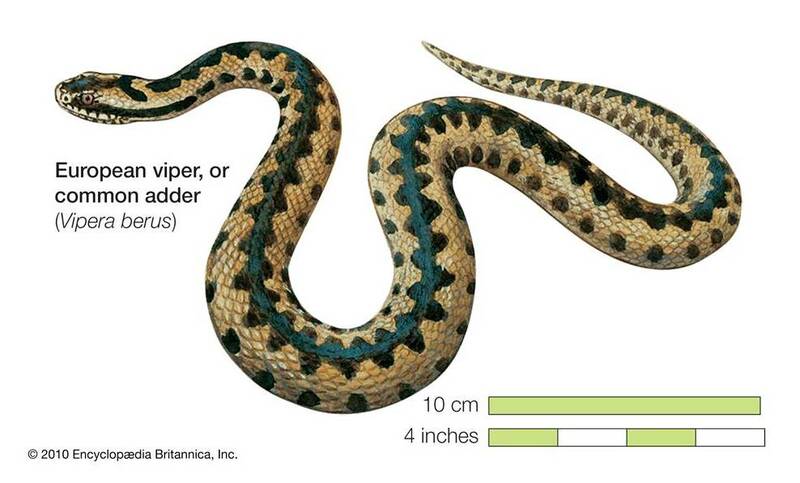 My landlord once burned my carefully tended compost pile, claiming that it attracted vipers. My neighbor would reprimand me if he saw me weeding without heavy gloves, convinced that a viper poised for the kill was lurking in every clump of weeds, or gasped in horror if I walked in sandals through the tall grass. I laughed this off, and they would just shake their heads and utter an ominous “Vedrai” – You’ll see. I did quiz my neighbors as to the appearance of a viper- so that I might recognize it when my moment arrived- and the stories were always a bit different. It was colore piombo – the color of lead – it was brown, it was colore piombo and brown, it had a pattern on it, but the pattern could differ… and then one fine day, I spied a snake that gave me pause. It was brownish grey, and it had a pattern along its side. Since two of my neighbors were noisily working on the building behind my house, I went to call them, saying I thought I had seen a viper. They seemed thrilled and came in a rush. The snake was still there, partly visible behind a terracotta flower pot. “Una bella vipera”, proclaimed Enrico, and went looking for a weapon. “Ah, si, una bella vipera, bella grossa” Vasco concurs, a nice big viper. Vasco moves the terracotta vase slightly and the snake runs for cover, but Enrico strikes with a shovel, whacking it several times, until it is cut in half. There is a brief but bloody squirming scene before all is calm. Vasco peers closely at the snake and decides it’s not a viper after all, and tosses both halves of the poor snake into the vineyards. I decide to brush-up on my viper knowledge so as to avoid any further slaughter of the innocent. The viper berus, or common adder, has a pronounced zig-zig pattern along its back, it’s mostly brown with a flat triangular head, and a very narrow “tail.” You’ll be happy to know that they are not fast movers, so do not strike quickly when disturbed. The viper is a poisonous snake that is, thankfully, rarely fatal to humans, though it can cause extreme swelling and pain. They really only strike when threatened, and will probably pack up and leave a garden or vineyard if disturbed too often. Vipers do not like wet grass and damp spots, preferring, as I do, to bask in the sun on a stone wall or along a footpath. They give birth in September and hibernate from about October to March, so any vipers found lurking in the vineyards during the fall grape harvest would tend to be naughty babies or sleepy grown-ups. The most dangerous time for encountering vipers is April and May, when they have come out of hibernation and, like humans, are prone to frolicking on a spring day. Of course, none of this information keeps me from walking the trails of Chianti, and in 17 years of walking I have encountered only a handful of vipers, and have never been in danger of being bitten. Nor does it keep me from feeling the excitement of the harvest, as I walk up the hill through the Sangiovese vineyards to Volpaia, a small village dedicated to wine making. The smell of fermenting wine permeates village and the streets are stained purple, so the harvest is in full swing. I stop for a glass of Chianti Classico and pecorino cheese at Paola’s place, and listen to everyone talking about the harvest and whether or not the wine will be just good or great. After lunch, I set off back down the cypress-lined drive towards home, remembering to watch where I step. Details: Volpaia is located on a hilltop across the valley from Radda in Chianti, about 10 km along a winding road. Walks in the area are only partially marked. Our Tuscany Hilltowns walking tour visits the cellars of Castello di Volpaia (by appointment only) during a 3-day stay in Radda in Chianti where we recommend Hotel Palazzo Leopoldo or Relais Fattoria Vignale. In Volpaia, Paola at the Bar Ucci serves light lunches, or across the street at her sister Carla’s place La Bottega, you can enjoy a full meal. 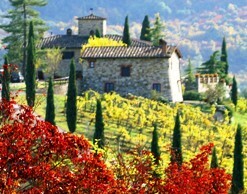 For more articles about Chianti wine, read the posts on an interesting wine blog, Global Gourmet. I just returned from Tuscany and Cinque Terra and saw a monorail train(tram) that grape and olive farmers use to transport grapes up and down steep slopes. Do you know who manufacturers these grape harvesting trains? Hello Phil – I don’t know the manufacturer, but you might try searching in Italian under “monorotaie Cinque Terre”. They also exist in Switzerland, so could also be manufactured there. Good luck with your search! Your writing is quite descriptive and enjoyable to read…wonderful images of Italian life…reminds me of an old friend of my mother’s who has since passed on named “Mimi”. She told the greatest stories…and was An Italian WWII bride. Thanks for sharing. Good article, Thank you. I got curious when one morning while staying Le Leppe I saw 4 or 5 horsemen all dressed alike wearing snake boots and carrying long forked “snake” sticks. Their dress was uniform. What do they do with the snakes? and do they find many/ Interesting. This is such a nice blog, glad you do it. I hope to take us back to Tuscany soon and will be happy to learn from you.